Enchilada Dinner - $6.00 a plate. The dinner will be served from 4:00 to 8:00 pm in the cafeteria. A silent auction will be conducted during the game. Our “new” Steer Mascot will also be wandering around the gym during games accepting donations. There will also be several donation jars set up around the gym area for you to contribute anonymously. 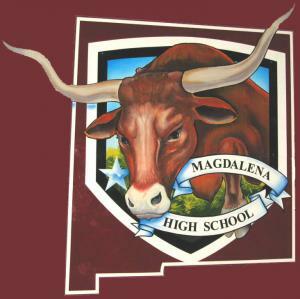 The Magdalena Municipal School District is a Pre-K through 12th grade school, which is housed on a single campus. MMSD has a multicultural student population of 357. The ethnic structure of the district is approximately 47% Navajo, 29% Hispanic, and 24% Anglo or other. Additionally, in 1988 the district implemented a four-day week schedule to help address and accommodate students who are bussed significant distances. Over half of all MMSD students are bussed, with an average bus ride being 26 miles one way. The longest distance any one student has to travel is 70 miles one way. The Village of Magdalena is located on the edge of the Cibola National Forest, at the base of the Magdalena Mountains in central New Mexico. The nearest city is Socorro located 26 miles to the east, Albuquerque, New Mexico’s largest city, 100 miles to the northeast. Magdalena’s population is approximately 1,100 and reflects the community’s unique history as a mining town and as one of the largest cattle shipping centers west of Kansas City. Its nickname, “Trail’s End,” is an enduring reminder that for nearly 70 years (1890s-1960s) Magdalena was the end of the trail for cattle drives originating from Arizona to southern Colorado. Today the community’s principal industries consists of education; the federal government in the form of the National Forest Service; the National Radio and Astronomy Observatory, which operates the Very Large Array (the worlds largest radio telescope) located on the San Augustine plains 25 miles west of Magdalena; the Bureau of Indian Affairs which operates a charter school and Indian Health Services clinic on the Alamo Navajo Indian reservation; and, finally ranching. The public school district is the largest employer. The Alamo Navajo reservation is located 29 miles north of Magdalena, and is a vital part of the community at large. Although Alamo is a Chapter of the Navajo Nation, it is located approximately 200 miles southeast of the largest reservation in Arizona. Because of their isolation, the Alamo people have maintained a unique traditional and linguistic heritage. The Alamo band is the only living Native American group who is a blend of Navajo and Apache tribes. The Alamo dialect (Navajo) is predominate in the homes and in all tribal government, religious, social, and cultural interactions.